The gatk-workflows git organization houses a set of repositories containing workflows contributed by the Broad Institute and optimized versions of these workflows contributed by Intel to take advantage of the latest technologies like FPGA processors to accelerate time and performance. The workflows made available include several types of genomic analysis methods using GATK’s Best Practices, such as Data Preprocessing for Variant Discovery, Somatic Sequence Analysis using Mutect, and simpler workflows used for sequence format conversion. The provided workflows have an accompanying JSON file containing references, resources, default parameters, and input bam files used to test the workflow on the users given platform. The document below will guide users on executing an example workflow on the Google Cloud Platform as well as running the workflow locally. Please note that Broad is moving towards a cloud-centric computing environment, thus the provided workflows are designed and intended to work on the cloud. Some of these workflows may need to be modified by the user before executing on a local environment. Make a directory to test workflows then change into that directory. that will run the WDL. Clone the repository you would like to execute. In this example we will being executing validate bam from the seq-format-validation repository. Once you’ve successfully cloned the repository, seq-format-validation directory will appear in your gatk-workflows working directory. The seq-format-validation directory has multiple files but we are only concerned with the WDL and its json. We’ll be running the validate-bam.wdl workflow using its accompanying json file validate-bam.inputs.json. The json contains some required/optional parameters needed to run the workflow, including the path to a test input file located in a Google Cloud bucket. 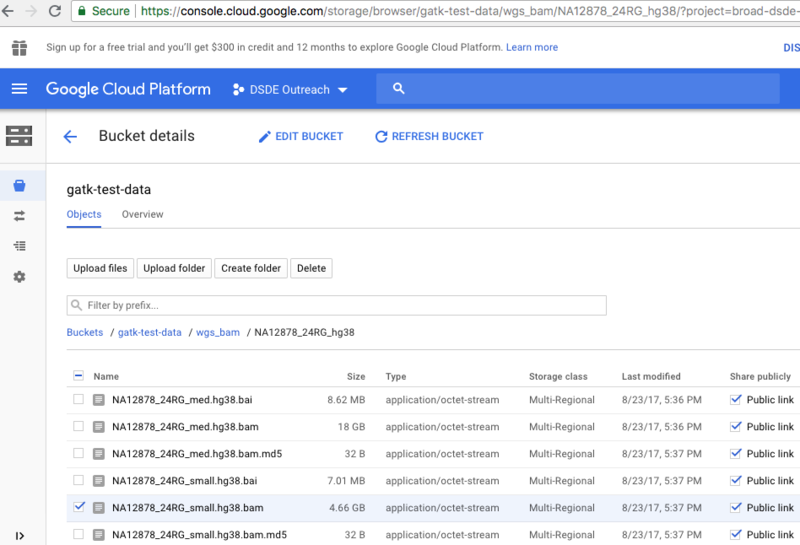 We have our WDL and we have a json file, but we need one more file to run on Google Cloud. This would be a configuration file to indicate to Cromwell that we would like to execute our workflow on the cloud. You can create your own configuration using the instructions found on Cromwell Documentation. In this example we'll name our conf file google-adc.conf and copy the contents below into our file. // Polling for completion backs-off gradually for slower-running jobs. // Optional Dockerhub Credentials. Can be used to access private docker images. // Pipelines and manipulate auth JSONs. // Endpoint for APIs, no reason to change this unless directed by Google. Before you execute the workflow you'll need to two pieces of information: 1) the project that will pay for the run, and 2) where to store your output files. The set project name can be determined by entering gcloud info in your terminal. The project name will be listed under "Current Properties"
It's time to execute the workflow. While the workflow is running, Cromwell will print out logs to your screen (lots of it). Once it completes it will print out a message indicating the run was successful. Also, it will print out the Google bucket location of the output files that was generated by your workflow. Make a working directory to test workflows then change into that directory. Make a directory to store input files. Download latest release of Cromwell, the java excutable that will run the WDL. Clone the repository you would like to execute. In this example we will be executing validate bam from the seq-format-validation repository. Once you’ve successfully cloned the repository, seq-format-validation directory will be in your gatk-workflows working directory. The seq-format-validation directory has multiple files but we are only concerned with the wdl and its json. We’ll be running the validate-bam.wdl workflow using its accompanying json file validate-bam.inputs.json. The json contains some required/optional parameters needed to run the workflow, including the path to the input file located in a Google Cloud bucket. Since we're running this locally we’ll need to first download any files mentioned in the json. In this case we’ll only need to download the input files but the same instructions can be used for reference/resource files. *Special note, because this is a local demo and the size of the medium bam file is 18 GB, we’ll only download and work with the small bam file. The base Google bucket name is gs://gatk-test-data, a weblink to this Google bucket is provided in this document under the subtitle Key Google Cloud buckets. We use this web link to take us to the Google bucket of interest in our web browser then use the file path provided in the json (e.g. /wgs_bam/NA12878_24RG_hg38/NA12878_24RG_med.hg38.bam) to locate the files in the bucket. The following files can be downloaded by clicking on the file names. Once the file is downloaded, be sure it is moved to gatk-workflows/inputs/ directory. Next we’ll edit the json file so that all gs:// file paths are replaced local file paths. While the workflow is running cromwell will print out logs to your screen (lots of it). Once it completes it will print out a message indicating the run was successful. Also, it will print out the location of the output files that was generated by your workflow. Side note After the workflow completes you’ll see two directories cromwell-executions and cromwell-workflow-logs. cromwell-workflow-logs will have a log file for each job you execute, while cromwell-executions will contain outputs generated by your executed job. cromwell-executions directory level will have a directory for each workflow you’ve run. We’ve only run ValidateBamsWf (title of workflow found in the WDL script in workflow block) so that will be the only folder that you will see. It is the user’s responsibility to alter the json to meet their needs, example json files should not be used in production without being customized and vetted by principle scientists.